"so much to celebrate about this show"
There's a new kid on the block, and he comes in the shape of a sensational new pop musical, fresh from the hands of Tom MacRae and The Feeling's Dan Gillespie-Sells. Everybody's Talking About Jamie is the Sheffield-born project, based on the 2011 BBC documentary Jamie: Drag Queen at 16. 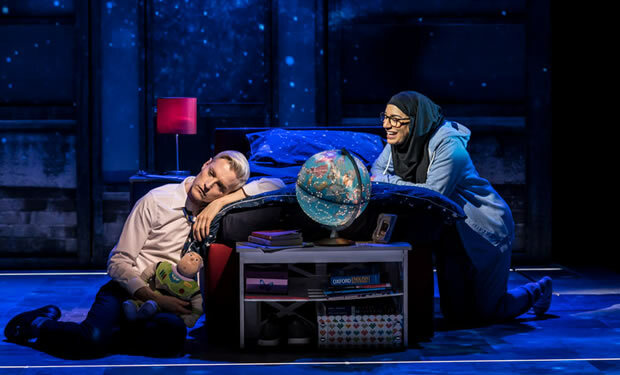 It's a punch-in-the-air story of acceptance, believing in yourself and becoming who you want to be – and it couldn't be more suited to the West End. Jamie is riotous, surprisingly funny, and wonderfully camp, following the story of Jamie New, a 16-year-old boy who is just that bit too sassy for school. Set against the superb backdrop of Anna Fleischle's grubby concrete design, we're introduced to his incredibly supportive mother and schoolmates, with a dab of Billy Elliot-esque father and typical insecure school bully. Sharply led by director Jonathan Butterell, who also co-wrote the script, the production flows along nicely, with pumping music between each scene and exciting choreography from Kate Prince. There's a superb soundtrack that structures the story, with stand-out numbers including the memorable "Don't Even Know It" and "Everybody's Talking About Jamie", with some heart-rending ballads too. It signals that this project was a proper labour of love, with a dedicated cast and creative team fuelling it. John McCrea as Jamie is simply superb, matching the extravagant with the understated. There is a strong and believable dynamic between McCrea and a particularly good Josie Walker as mum Margaret, which is a joy to watch. Mina Anwar provides a hearty dose of comedy as straight-talking friend-of-the-family Ray, whilst Lucie Shorthouse is a revelation as Jamie’s reserved best friend Pritti Pasha. There's so much to celebrate about this show. It promotes diversity and acceptance, two things that continue to be highly topical in the West End. It brings to light the struggle of young people not knowing who they are or who they want to become. It highlights the lack of support system in education. None of it is exaggeration; it's all completely believable, and completely true. The dynamic of audience members is astounding; kids and grandmas sitting together to enjoy a show that ultimately celebrates being different. It's educational and it's important, but most of all it's an incredible amount of fun, with a devoted team behind it bolstering the message. With a decline in really good new British musicals, Jamie has sashayed through the cracks and promises to be a whopper. In fact, it won't be long before EVERYBODY'S talking about Jamie.